On July 25, 2017, RESISTANCE™ will land on Ibiza for the opening night of an eight-week residency at the world’s largest nightclub, Privilege. 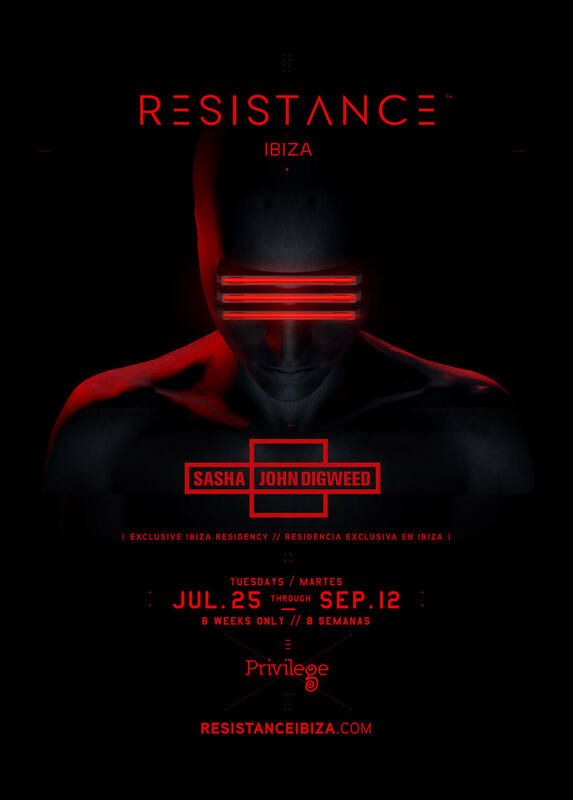 The brand’s first official foray onto the White Isle, RESISTANCE™ will run every Tuesday from July 25 until the official closing party on September 12. Confirmed for the first six parties, British legends Sasha & John Digweed have been announced for an exclusive Ibiza residency, with the pair making no other appearances together on the island this summer. Resistance has been making massive inroads around the World with their forward thinking lineups, high quality sound and next level productions. To be a part of their first residency in Ibiza is a huge honor and something I am excited to be part of. The fact that they have chosen the biggest club in Ibiza shows they are intent on making a big noise on the island right from the start. There is no better feeling than playing to a massive room full of people throbbing in unison to your set. Really looking forward to playing alongside Sasha and a host of world class DJs on this night. 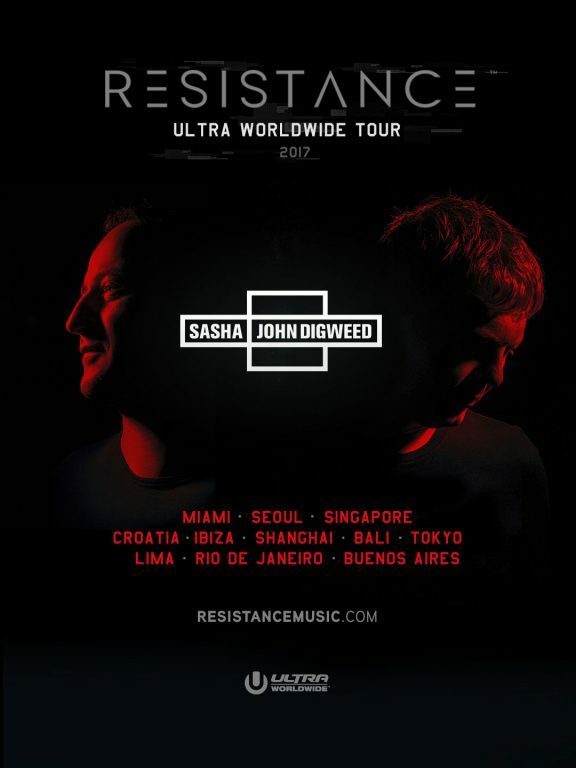 This exclusive Ibiza residency forms part of Sasha & John Digweed’s huge RESISTANCE™ World Tour, with the duo set to perform together at RESISTANCE™ events in 11 destinations this year – Miami, Korea, Singapore, Croatia, Ibiza, China, Bali, Japan, Brazil, Argentina & Peru. Tickets for all eight Ibiza parties are now on sale at ResistanceIbiza.com. The full lineups for each event will be announced soon. First conceived at ULTRA Buenos Aires in February 2015, the RESISTANCE™ concept was then rolled out at Ultra Music Festival Miami the very same year. Housed in the awe-inspiring, state-of-the-art ‘Afterburner’ stage, powered by Arcadia Spectacular, RESISTANCE™ drew huge international attention and has since had custom productions on five continents. 2016 saw RESISTANCE™ team up with Arcadia in Miami once again, this time for the highly anticipated North American debut of the legendary ‘SPIDER’ structure. In only its second year, the RESISTANCE™ concept continued to expand at breakneck speed, touching down in ten countries spanning five continents, with events in the USA, Croatia, South Africa, Singapore, Bali, Tokyo, Brazil and three standalone events in Paraguay (Asunción), Peru (Lima) and Chile (Santiago). The 2017 edition of ULTRA MUSIC FESTIVAL will see RESISTANCE™ dominate not one, but two huge stages at Bayfront Park as it grows into a festival within the festival. In addition to welcoming back the SPIDER across all three days of the event, RESISTANCE™ will now team up with its recently announced global ambassador Carl Cox to take over the Megastructure on Friday, March 24 and Saturday, March 25.